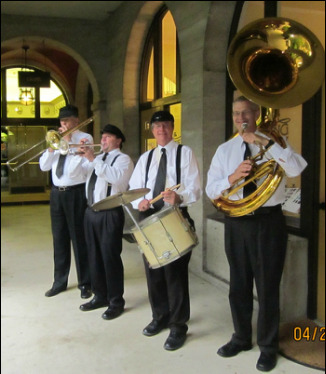 Their stationary (powered) band performs Dixieland Jazz, Americana Music, Zydeco music and can smoothly transition into more contemporary styles of music. The Basin Street Dixieland Band carries million dollar liability insurance which most venues require. (2 - 7 pieces) Features trumpet player/vocalist, Mark along with Kathy on vocals and Zydeco rubboard. They are backed up by some of the best Dixieland Jazz musicians in Orlando. The strolling band is ideal for second line parades by moving guests from one location to another and as atmosphere entertainment. The Basin Street Strolling Band requires no electricity. The strolling 2 piece and 3 piece band uses a small cordless portable sound system on wheels, which is just under two feet tall. The 4 to 8 piece bands are available with or without the portable sound system. 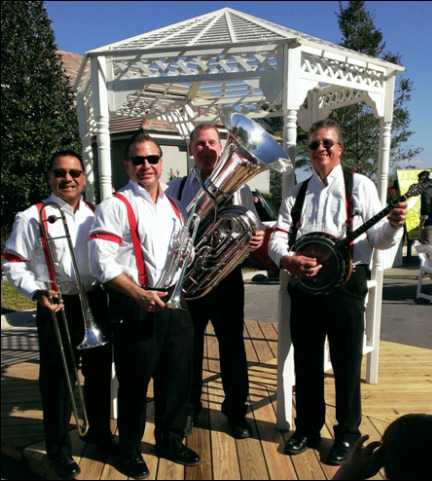 They perform Dixieland Jazz, Zydeco and New Orleans Favorites. They specialize in drawing the crowd in, and performing this one of a kind, unique music direct from the big easy. Orlando's premier corporate entertainment. The Basin Street Band providing convention entertainment for trade shows.